To bring down bigger buffalo, leaders need to free up more time so they can apply their skills to the most critical areas of their business. So you need your people to step up. But it takes time and considerable effort on your part to get your team performing at your level. The truth is you CAN get your team operating at your level. Where most leaders fall down is communicating clearly the steps required to do what you do. 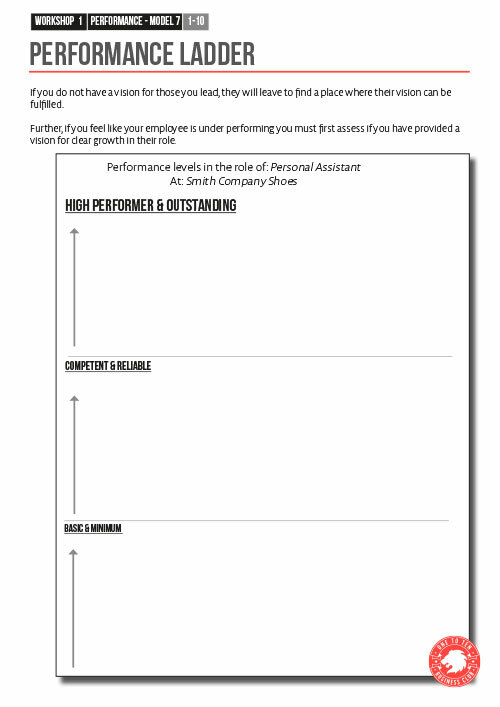 The Performance Ladder is a tool that will help improve the performance of your people by giving clearer instructions. It uses a 3-tier approach to give your people a development path towards elite performance. Delegate more effectively so you free up more time. Develop potent position descriptions which clearly state the activities required to be competent in the role, and what additional activities are needed to be considered ‘elite’. Retain top performers (as they see clear career and skill progression). Have difficult but necessary conversations about performance which focus solely on skill and activity. Download the Performance Ladder worksheet so you can develop potent position descriptions, and give your team clear feedback on where they currently are and what is needed to get them to where they want to be.